Knowledge and expertise is your fastest path to success. Whether you're a customer or a Partner, accelerate your learning with hands-on training courses to take full advantage of ZOOM solutions. Education and training are critical components to making ZOOM software work for you. Developed by our highly experienced trainers, our intensive user, technical and pre-sales courses will give tou the skills, knowledge and best practices you need for sustained success. Sign up today for in-depth training through the ZOOM Learning Center and become an expert in all aspects of QM Suite. Provides you with working knowledge of all the key features of ZOOM QM Suite, so you can utilize your investment to its fullest extent and kick-start your successful quality management program. Designed to provide your technical staff with the expert skills needed to successfully deploy, install, configure, administer and support ZOOM QM Suite. Build the knowledge and skills you need to position, present and deliver ZOOM solutions and project support during the pre-sales cycle. Onsite or remote interactive courses for contact center managers, supervisors and administrators to ensure that the customer is fully knowledgeable on how to use ZOOM software in daily life. Available onsite or remotely, these interactive courses for contact center managers, supervisors and administrators will give you in-depth knowledge of all aspects of using ZOOM QM in practice. This course is aimed at technical staff. 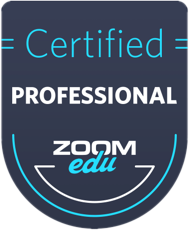 Become a ZOOM Certified Professional and provide premier professional services with every project. Acquire the necessary skills and technical expertise for implementing and supporting ZOOM QM Suite, including single and cluster server configuration, inter-module communication, and Media Lifecycle Management. This highly technical course is geared toward technical staff with extensive practical knowledge of our products. The technical scope of this course extends beyond that of our other courses, involving an in-depth review of cluster deployment, log files, various scripts and tools, database schema, high-availability deployment, and upgrading procedures. Participants are required to successfully complete the Professional Technical Training Course prior to enrollment. This course is designed for presales staff. 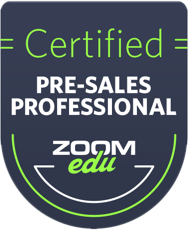 Become a ZOOM Certified Presales Professional and learn how to provide exceptional service by attending this presales course. Increase your skills and expertise for presenting and designing high-caliber QM Suite solutions and providing superior project support during the presales cycle. Course subjects include an introduction to QM Suite, ZOOM consulting services, contact center integration, and QM Suite architecture requirements.